Hi everyone! Allison Davis here with a Life Documented layout using the Sn@p! Love Set and I've got another sketch that mixes the Sn@p! Pocket Pages with traditional scrapbooking! I have a confession to make. I am obsessed with hearts. All things hearts. I have shirts with hearts, necklaces with hearts, a heart change purse, heart bookends, heart decor, heart headbands, heart drinking glasses...hearts, hearts, hearts! Naturally this love for hearts has made it's way into my scrapbooking as well. I use them all the time whether it's a layout covered in hearts or just simply sneaking in a teeny tiny heart on an embellishment. It's probably pretty obvious that I love the month of February since everything is covered in hearts! I figured that if I was going to make a sketch to celebrate my love for hearts, then this would be the perfect month for it. The Sn@p! Love Set was the perfect choice for not just this sketch but my pictures too. This set has so many great cards and lots of hearts! On the left page I wanted to have a little fun with that huge heart background. I've done so many layouts with a large heart background like that so I wanted to put a new spin on an old idea. I decided to cut a lot of 1 x 3" strips of paper and use them to create my own pattern on the heart. I started by cutting out a large heart from a piece of cardstock. Then I started adhering the strips in a pattern until I had the whole heart covered. After that I trimmed around the heart to cut off the part of the strips that where hanging over the edge. To finish the design I added stitching over the strips. (My junior high home economics teacher would never believe that I stitched this! I wouldn't blame her since in her class I somehow managed to sew the elbow of my sweatshirt to the collar.) The stitching was time consuming but I love the look of stitching and the texture it adds. Plus, I really like the quilted look when making patterns like this. There are so many patterns you could make to create a unique design on that heart background. You could try small squares, a chevron pattern, triangles, smaller hearts, circles, torn strips of paper, larger stripes of paper going across the whole heart, banners, or a starburst. There are so many possibilities! I had my son, Jackson, help with this layout. For the journaling he finished the sentence, "I love my dad because..." I try to have my kids help me with the journaling on a lot of layouts. As scrapbookers we are often so used to just capturing our perspectives. Sometimes it's fun to get other loved one's views on layouts too. Plus, kids usually say some really cute and funny stuff! One the right page I used a Pocket Page with a mix of photos and cards to match the left page. I added a few of my own little heart details to the cards and pictures. On the top photo I added three punched hearts, some stitching, and the cute little phrase sticker. Both of these 3x4 cards were two of my favorites in the whole set. The first with the hearts had a nice open space perfect for a small 3 x 2" photo. The second, "All you need is love", is one of my favorite sayings. On the bottom part of the Pocket Page I used two more 3x4 cards. The first one had enough space for me to add another 3x2 photo, like I did on the card at the top. I added a little extra detail by stitching a heart frame around the "i ♥ you". The second card is a check list and instead of just checking each item, I used small punched hearts as the check. On the 4x6 card on the bottom, I added a small 2x2 photo to the frame and a small yellow heart to the arrow. I will be using the 12x12 Sn@p! Leather Album in black for all of my Life Documented pages. I love the details like the metal accents and stitching. I used the 12x12 Sn@p! Pocket Pages, Design 6 from the Variety Pack. You get so many different options and great designs with the Variety Pack! I hope you all enjoy using the new Life Documented sketch! This card is one of the 3x4 SN@P! cards from our new Cat SN@P! Set that we introduced as part of our Winter 2014 release. Without going into a reallllly long story that spans 3 cats over 20 plus years, we currently have 2 cats. And I'm NOT a cat person. Like I said, long story. If we ever meet in person and there's a lull in our conversation, ask me about cats... Anyway, I love this devil cat card. If you've ever had a cat, I'm sure you know what I mean - sometimes they can be little devils! I am still loving the chalkboard trend and I am really in love with the new square sizes of cards! Perfect with all the Instagram photos out there! The outline fount is also a favorite of mine. LOVE this card! I picked the two cards with the wiener dog (or dachshund). The first card has the head of the dog and the second card has the tail end of the dog. We have two dachshund's, Oscar and Abbey, so I was especially drawn to those two cards. I love that the dog is split, head and tail, between the two cards! I can't wait to use those! First of all I absolutely adore the chevron background and the fun font colours. That makes me happy. Second of all, this phrase is just a great reminder that everyday doesn't have to be incredibly awesome. I can always find something good in my day, no matter how small it may be - perhaps enjoying that morning cup of coffee or my kiddos making their beds in the morning! Angella created this amazing house minibook, using this card as the cover! Don't you just love that; what a great way to use one of our SN@P! Cut cards! OK, now to more good stuff. At the beginning of this post I mentioned something about a giveaway! Enter via the Rafflecopter widget below by end of day Thursday, February 6th telling me which of our 6 cards is your favorite and why. On Friday I'll draw one random lucky winner to win not only the cards we selected, but the rest of the cards that are included with each package the cards are from - that's 180 fabulous Simple Stories cards, people! Hi everyone! 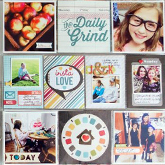 Lisa here with you today to share some layouts I made with the fabulous Daily Grind collection. You'll notice a lot of layering on my pages — not just papers, but embellishments too. OK, mostly embellishments. :) Part of what I love about scrapbooking is finding the "right" combination of embellishments to help tell the story. Simple Stories offers a wide variety of embellishments so there are endless possibilities when it comes to combining them. This first page, called The Everyday, details my daughter's current daily routine. Circles punched from the Pieces of Flair Paper are mixed with the round Fundamental Cardstock stickers and placed around the page. A 3x4 Journaling Card, stitched to the page, houses a journaling tag. Here's a look at the embellishment cluster in the top left corner of the page. Fundamental Cardstock stickers are mixed, and layered, with chipboard and pieces from the Ephemera pack. This next page is called The Reading Room and it documents my daughter's love of reading. I layered journaling spots from the Ephemera pack and trailed them down the page. I hope these pages inspire you to look at your embellishments in a new way and to use them to create layered clusters on your projects. The first one features the Homspun SN@P! Cuts - they are the perfect size for cards! This next one shows off the Insta-squares (these make such quick and easy cards). And lastly, a combination of Insta-squares and Bits & Pieces. It was fun to stitch the little pieces together like a quilt. When a paper collection does all the work for you, making cards is quick, easy, and most of all - FUN! To check out three more cards made with A Charmed Life collection, visit my blog! Hello, Simple Stories fans! Melissa here to share a week in my Life Documented album that uses the mid-release Daily Grind collection- I wanted to take this collection out for one last spin before the new lines from CHA Winter arrived. You may have already read my post from last November where I used Daily Grind for the first time, and this time around I put a slightly different, slightly seasonal spin on it. My previous Life Documented layout with Daily Grind was from a summer week and used pretty much all of the colors in the collection. For this particular week, though, I went with a warn fall palette of orange, red, and yellow since the photos were taken in October and incorporate some seasonal activities. A few of the other colors from the collection do make an appearance, but only in tiny amounts and mostly in the embellishments. With an everyday collection like Daily Grind, taking it from non-themed to seasonal is really just as easy as choosing just a few colors from the palette! It doesn't matter at all that there aren't any "fall" specific embellishments on the page because the photos themselves convey that message. Even if you're not going for a seasonal look, pulling out just a subset of the colors in any collection is a great way to get a whole new look from the line and stretch your scraps and scrapbooking dollars even further. I don't often use see-through elements in my Life Documented album because I have so many photos and don't want to commit to having an entire pocket taken up on the opposite side of the Pocket Page. I challenged myself to find other creative ways to use Sn@p Cuts from the collection and found that they make great layering elements! I used two of them on this layout and backed them with pieces of patterned paper, then used small chipboard pieces as accents in two of the negative spaces. You might notice that while I used lots of colorful patterned paper in the 4x6 pockets, I used mostly neutral journaling spots in the 3x4 pockets with just a bit of patterned paper under some of the smaller photos. That helped to keep color and pattern the spread from getting out of hand, and it also gave me the chance to use up some of the great natural textures from the collection including cork and woodgrain. As I close out my 2011 and 2013 (2012 is finished- woohoo!) Life Documented albums, I'm using the 12x12 faux leather Sn@p in teal to hold my layouts. The longer I use these albums the more I fall madly in love with their quality (even my Dad has commented on how well they are made! ), and I'm looking forward to continuing my Life Documented layouts in a 6x8 format (again, in a teal album) in 2014 when I get my first batch of photos from the start of this year back from the printer. All of my weekly Life Documented pages for 2011, 2012, and 2013 use Design 3 Pocket Pages. 2014 is going to be a wild and crazy (well, it qualifies as wild and crazy around here) adventure of mixing up all of Simple Stories' 6x8 designs, including the new Insta-Pocket Pages. Hey there! It's Vicki checking in today. Hope you are keeping warm if you happen to be in one of the areas being hit with frigid weather. I for one could do with some sunshine and warmer temperatures. I can't wait for spring! And what better way to conjour the joys of warmer days than with flowers! So today I wanted to share a layout I created using the brand new Homespun collection for CHA. I filled this page with flowery goodness and my family who warm my heart, if not my cold toes! I diecut the flowers with a Spellbinders die and layered them with foam adhesive and the brand new Homespun brads. I am a big fan of die cuts...so happy with the new Bits & Pieces that were released. Take a look at the key and the "together" tag. I am over the moon with excitement over the new Homespun Chipboard!!! This stitched "family" is beautiful!!! Here is one more close up of the flowers. The papers/patterns in Homespun are beautiful. I love the little bit of distress with the burlap and woodgrain. Hi, everyone! Teri here with a Life Documented project! I'm here to show you a couple pages I made recently with Simple Stories' Daily Grind collection! When one of my buddies paid a visit this month, we spent a couple days hitting the local attractions. I took so many pictures and collected so many trinkets from the museums we went to that I inspired to make this two-page spread. The left page focuses on our first stop: the local science museum. A traveling exhibit on Sherlock Holmes was in town, and we managed to hit it on the very last day. The lines were super, super long. In fact, there was a two-hour wait to get in! But it was so worth it. We learned all about the science of solving crimes and also got to see some real life props from the Sherlock Holmes' inspired movies and television shows. So cool! Rather than spending a lot of time resizing pictures to work on this page, I instead opted to just print a bunch out as 4x6 pictures and then cut them down with my paper trimmer. To give the page a little extra personality, I cut some strips of Daily Grind paper and added them right to some of the pictures. I also plopped a few stickers right on top of the Pocket Pages. I customized this card (cut from a piece of Daily Grind paper) by adding some stickers, paper strips and a brad to it. And I tucked my ticket and a few receipts from the day into this pocket here. I used the right page of my layout to focus on the next day's activity: a trip to the local forestry center. I've lived near this museum much of my life, but I had never paid a visit to it. My friend had never been there either so it made for a fun afternoon! One of the things I really love that comes in the Daily Grind 12x12 Collection Kit is the photo overlays. I didn't have any pictures to use them on for these pages, but I knew I wanted to use a couple of them in some way. So I created the title card (of sorts) for my page here with one of them (and some patterned paper and an assortment of Daily Grind embellishments). I also cut down one of the overlays to fit in this pocket here. By the way, that's a die-cut (from the Ephemera pack from Daily Grind collection) that I typed on and then mounted right onto the overlay. After I was all done putting together these pages, I realized I still had a few postcards, pamplets and trinkets from the two adventures. So what what did I do? I added them to my spread. I simply tucked the postcards and a couple pieces of paper into a 6x8 SN@P! page and then used my hole punch to punch holes into the pamphlets and add them to the binder. You'd think I planned it that way. Nope. It was just a happy accident. I'm using a 12x12 SN@P! Faux Leather Album in red to put my 2014 Life Documented pages in. I love that is holds so many pages and that the binder mechanism allows me to mix and match different pages styles and page sizes. I used SN@P! Pocket Pages Design 6 (3x4, 4x6) and Design 1o (3x4, 4x4) for my pages today. I also used a Pocket Page from the 6x8 Variety Pack. Again, I love the variety of page styles and sizes Simple Stories offers! Thanks for tuning in today. I hope you are off to a great weekend! I look forward to being back again soon! New Simple Stories Silhouette Designs Available! Howdy! Layle here today to share some great news - we have 12 brand new cut file designs, now available for the Silhouette! Design team member Nichol Magouirk used our Awesome Polaroid Frame cut file on a layout shared here on the blog yesterday. We have great designs currently available, with MANY more to come :) You can find these and our other designs here at the Silhouette Online Store. If you create anything with our Silhouette cut files, we'd love to see them! Hi everyone! Nichol here today to share a couple of my favorite ideas on using 3x4 Sn@p! Cards for a traditional 12x12 scrapbook page and a card. I absolutely love the 3x4 Sn@p! Cards (and the 4x6 Sn@p! Cards, too!) but I don't always want to use them for Life Documented layouts. No worries, these awesome little cards can be used in all kinds of fun, inventive ways! One of the quickest and easiest ways to use the 3x4 Sn@P! Cards? Simply adhere a 3x4 card to the center of a standard 5.5 x 4.25" card, embellish and you have a great handmade card! For this Valentine's Day card I took it a bit further and actually used 4 - 3x4 Sn@p! Cards from the Love Sn@p! Set. I used one 3x4 card as the center of my card (and pop of color on this otherwise black and white card) and die cut three others using the heart cut file (sn@p! plane, star, heart by Simple Stories) available in the Silhouette Online Store. Using the grid on the Silhouette cutting mat I was able to arrange the heart in the Silhouette Software so that the red text on the largest heart would cut and be part of my design. Here's a look at the cards after I die cut them. Notice that I used the "B" sides or back sides of most of these, even the red one used as the center of my card. I seem to gravitate towards "B" sides of most patterned papers so it's no surprise I like the back sides of the Sn@p! Cards as well! To make the die cuts stand out a bit, I die cut each of the hearts from solid black cardstock, slightly offset each and adhered them to my card with foam adhesive. I customized the banner sticker by cutting part of the design off as well since the colors didn't match the design of my card. I love that the background 3x4 red card is a subtle tone on tone "xoxo" and doesn't overpower the heart embellishments! For my layout share today, I used eight 3x4 Sn@p! Cards to create the collage effect on this page about my youngest son. I am currently addicted to creating, what I like to refer to as "mini canvases", on my 12x12 traditional scrapbook page layouts! In this instance, I took the 3x4 cards and added photos, embellishments, trimmed some smaller, etc. to create a collage look that is on trend and oh so fun! Breaking down the layout into smaller "pieces" makes it easy to implement any number of 3x4 cards into one space creating an overall large design! I also included a couple of die cuts into my page. The awesome frame (awesome, sn@pshot & good stuff polariods by Simple Stories) available from the Silhouette Online Store and the open circles 3x4 card (I trimmed mine down to fit the design) from www.kerribradford.com. I hope that these ideas have inspired you to try using your 3x4 Sn@p! Cards in new ways. Thanks for hanging out with me today! You may remember last year back in June when I introduced you to a super talented designer - Julie Johnson. Well, I've invited Julie back again this month to share an amazing SN@P! Binder she created with our Daily Grind collection! She's created a FABULOUS SN@P! Binder for one of her January kits using our Daily Grind collection that I'm thrilled to share with you. Here are some shots of her project, prepared to be WOWED! Thanks Julie for sharing our work with us again!! Paisleys and Polka Dots is a non-subscription monthly kit club that is a little different from the rest. Maybe you find yourself in need of some inspiration, you are too busy and need something quick and easy, or you just can’t figure out those cutting instructions from a pre-designed kit. Paisleys and Polka Dots take the guess work out of designing, so they are perfect for beginners, but also detailed enough for the seasoned scrapper to appreciate. All kits are pre-cut and packaged by page, so there is no more guessing what goes where. Their kits are also perfect for crops; grab a few of your tools and supplies and you are good to go. New kits are released at the beginning of each month and there is no subscription to join, so you choose only the kits you like. Visit Paisleys and Polka Dots at www.paisleysandpolkadots.com and on their blog at www.luv2createscraps.typepad.com/paisleysandpolkadots.